Two weeks ago I reported on a disturbing development in the NFL Concussion settlement after acquiring an email that revealed the off-the-public-docket war the NFL is waging against dementia claims and in so doing attempting to alter the terms of the billion dollar-plus agreement. 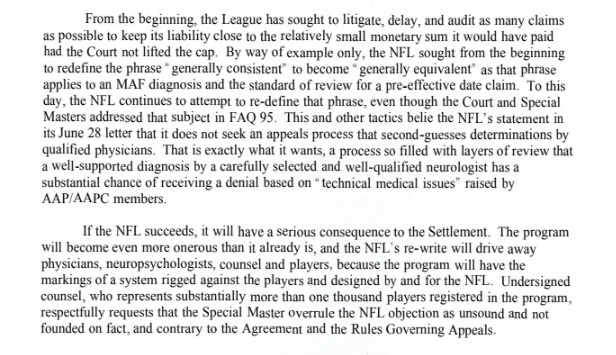 The email, which was sent to attorneys representing twenty-three players whose settlement awards were approved, appealed by the NFL, and affirmed by Special Masters on the appeal, reveals the NFL’s attempt to appeal these awards yet again, demanding review by the AAP panel of doctors established to assist Special Masters in certain instances, and at their discretion. The NFL’s demand, if granted will not only impact the twenty-three players whose twice approved awards hang in the balance, but every player who has a pending claim filed, or will in the future, file a claim for a monetary award. While on the surface the NFL’s demand for AAP review doesn’t sound particularly nefarious, a closer examination reveals a devious attempt to re-cap the uncapped settlement agreed upon by the parties and approved by the Court, barring all but the most severely impaired retirees from ever seeing relief, contrary to the terms of the agreement. To recap as briefly as possible, the NFL has attempted to eliminate the generally consistent evaluation of medical records with extremely stringent BAP protocols for pre-effective date diagnoses and examinations by approved MAF physicians to an exact duplicate of BAP protocols. This has been a tough battle for many with longstanding diagnoses, and numerous players who should qualify have not yet been granted an award. Despite the challenges, however, $535 million in monetary awards has been approved in the first eighteen months of the settlement. This figure equates to the projected awards at the ten-year mark, meaning there are a lot more affected players than the NFL wants to admit (or pay). 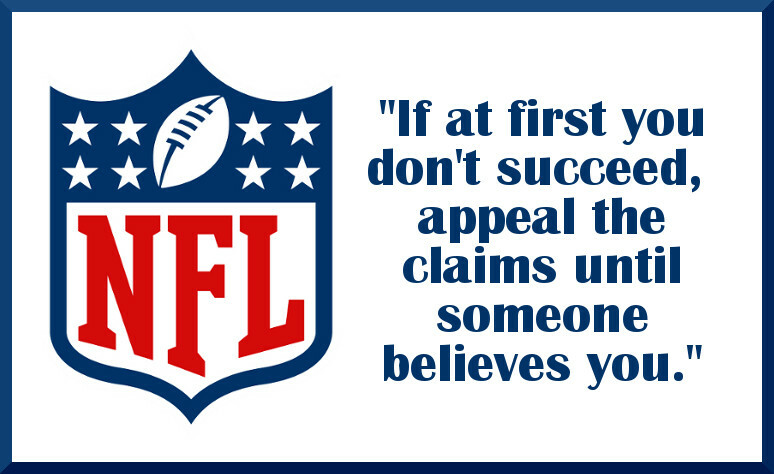 Since most pre-effective date claims have been processed or are in the cue and players are submitting claims based on settlement negotiated and approved MAF and BAP exams, the NFL now seeks to discredit qualifying diagnoses made by these physicians based on subjective and out of context “evidence” culled primarily from social media that might imply that a player still has a few moments of lucidity, existence of other medical conditions, and according to the newly acquired documents, sometimes merely the NFL’s opinion. Since the use of the AAP in audits resulted in a number of disqualified claims, the NFL now seeks AAP review of all appealed claims. A bit of reverse engineering of the NFL’s reason for doubting MAF diagnoses is useful. The NFL writes, “The Parties did not personally interview these physicians or train them on all aspects of the Settlement Program.” It would seem absurd to most people to have non-doctors training doctors, but if this is the NFL’s objection to MAF, and by extension BAP doctors, then the resulting logic would indicate that the NFL has played a role in “training” the AAP. “The Claims Administrator has provided them a manual…” Advocacy for Fairness in Sports has obtained and reviewed the manual the NFL refers to. In the manual myriads of testing protocols are outlined as described in Exhibits A-1 and A-2 of the final Settlement Agreement. There is even a test to evaluate if players are “malingering” or in other words, faking their symptoms. Despite the high bar that is set for receiving a qualifying diagnosis through the MAF and BAP programs, sick players are being evaluated in accordance with settlement terms and some of them are receiving diagnoses that qualify them for monetary awards. 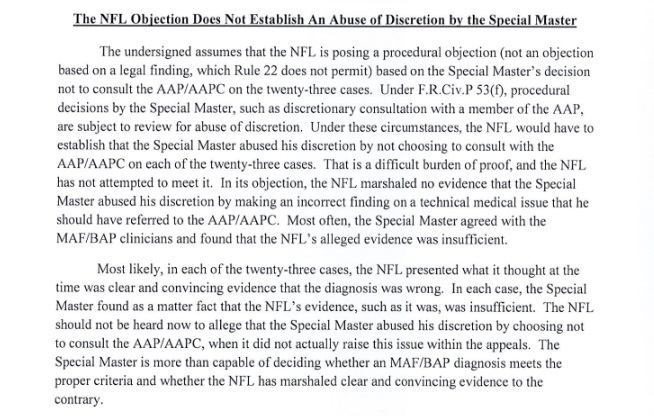 Though diagnoses are now being rendered by settlement approved doctors that are conducted in accordance with settlement requirements, the NFL argues these doctors are wrong, Special Masters are clueless when it comes to evaluating evidence and only the AAP that they have presumably groomed are the appropriate determiners of valid claims. Note the league doesn’t claim that the players aren’t impaired. Instead it seeks to achieve a “carefully calibrated and negotiated result,” meaning, in their own words, “not every retired player with cognitive or neurological issues” should be compensated for their injuries. The NFL’s strategy appears to be one of creating doubt and appealing and/or auditing claims over and over again until they can find someone to agree with them, relieving them of their obligation to pay the player. What the NFL seeks to do, however, flies not only in the face of the settlement agreement, but in the face of res judicata, a legal principle upon which our system of law is grounded and based on no lesser authority than the Fifth Amendment of the United States Constitution. It dictates that a cause of action may not be relitigated once a court renders a final judgment on the merits. To force these claims to be litigated again after having been presented, appealed and upheld defies the very foundations of our principles of law. While the res judicata argument was not raised by plaintiffs’ attorneys, letter briefs filed by Co-Lead Class Counsel Chris Seeger and David Langfitt of Locks Law Firm, on behalf of the twenty-three directly affected players present many other important and valid arguments against the unilateral changes the NFL schemes to impose. Both briefs are examined below. Langfitt compares the role of Special Masters to of that of a juror at a trial—” to determine the weight and credibility of evidence” and as such the Special Master as an experienced lawyer and judicial officer, is more qualified to make the evaluation in the context of the particular appeal than a AAP doctor who is only provided with certain disputed elements taken out of context from the whole. Contrary to the NFL’s allegations, Special Masters’ evaluation of the evidence does not constitute an abuse of discretion, but rather execution of the role to which they have been assigned. Who is better qualified to evaluate a player’s condition? A doctor who physically examined him or a doctor who has never examined a single NFL player in his entire career? Langfitt’s letter briefly profiles the twice approved claims the NFL has objected to paying and demonstrates that no specialized knowledge that the AAP might solely possess is necessary to determine the validity of the diagnoses. Phrased differently, the NFL attempts to cast doubt the on a third party affidavit that affirms the player was NOT impaired many years prior, in contrast with his present impairment. On a similar note in another claim the NFL attempted to sabotage a player’s test scores by claiming the college graduate with a successful NFL career was merely a low IQ individual. By the NFL’s reckoning, neither the settlement approved MAF physician nor any of this player’s prior medical records reflected his condition. The brief gives many other examples just as absurd as the ones above. As I’ve stated previously, I’ve personally reviewed around 50 claims the NFL has disputed, many of which were eventually affirmed by the Special Masters. I’ve seen test scores, sometimes complete medical records, and also the NFL’s appeal briefs with accompanying “evidence.” I wish I could share some of the actual photos, but for privacy considerations I cannot. The photos below, however are representative of the type of evidence the NFL uses to dispute medical diagnoses. 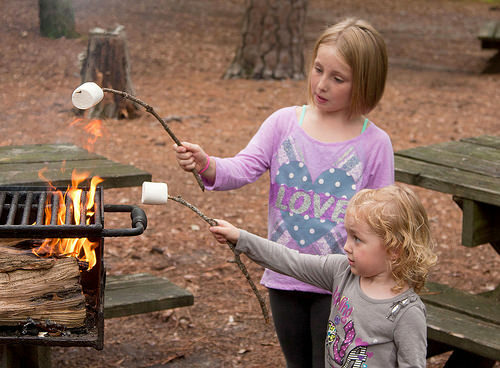 Based on some of the photos the NFL has submitted as evidence, ability to do something as simple as these little girls are doing should disqualify a player from an award, according to their reasoning. In the following paragraphs Langfitt describes the settlement to date and indicates the underlying nature of the NFL’s complaints. Langfitt asserts that the NFL should not be rewarded for its obstructionist behavior and suggests that it should be held accountable for interest on delayed awards to these players as well as attorney fees for the attorneys representing them. Elsewhere in the brief he strongly asserts that the fees, not be taken from the common benefit, but extracted separately from the NFL. This request is the roughly the equivalent of requesting sanctions for egregious, unreasonable, and bad faith conduct in a traditional courtroom setting. Seeger echoed the same arguments in his brief. While Co-Lead Class Counsel Chris Seeger has seemingly walked arm-in-arm with the NFL, supporting many of their prior motions, and arguably enabling some of their bully tactics, apparently, they have crossed his line of tolerance at the juncture. 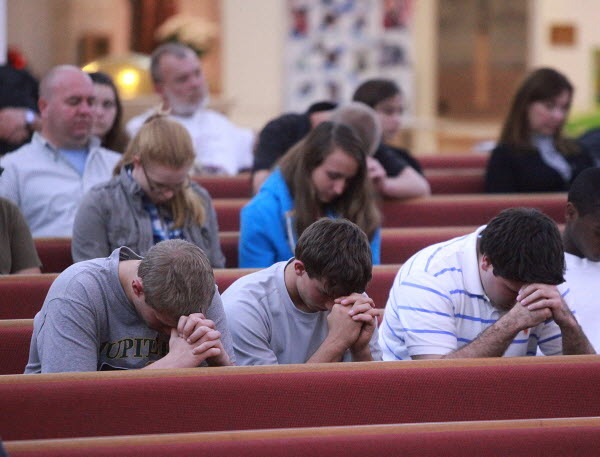 His brief reiterated many of the arguments in Langfitt’s brief and also decried the NFL’s heavy-handed aggression. 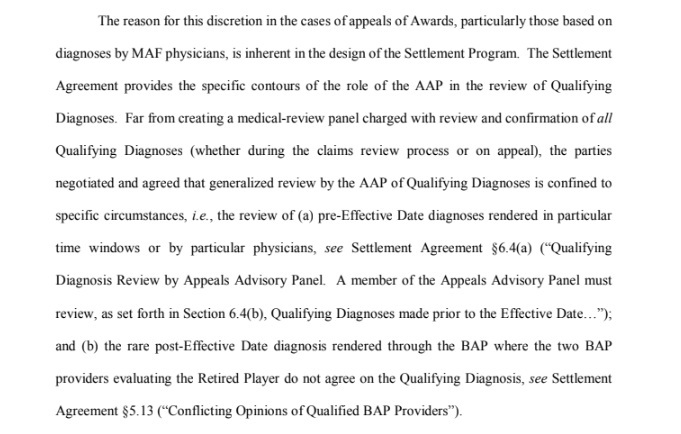 Seeger seemed to take particular issue with the NFL’s position on attacking MAF and BAP diagnoses which were made following the diagnostic criteria mandated by the settlement, in contrast to his more passive stance regarding pre-effective date claims. Seeger asserts that outside rare instances there is no need to question the diagnostics done by these Settlement approved physicians. Stringent requirements both in physician selection and the diagnostic tests to be administered were established and agreed upon by both Class Counsel and the NFL. For the NFL to be able to come back eighteen months into settlement implementation, upping the bar for an already difficult testing protocol is to destroy the very fabric of the agreement. Judge Brody has already appeased the NFL through granting their request for appointment of a special fraud investigator after initially appearing to opposed the idea. Her order followed an unexplained reversal of position by Special Masters who apparently felt pressured by the NFL. If Judge Brody also grants the AAP demand she needs to realize she is placing her legacy and credibility as well as public confidence in the justice system in considerable peril not to mention numerous lives. How could a plaintiff trust the process of entering into a settlement if a defendant is permitted to unilaterally revise the terms in its favor after the plaintiff has signed on the dotted line? MDL and class action settlements tend to operate largely in the dark during implementation phases, with negotiations and pre-settlement pleadings capturing the spotlight. The briefs highlighted in this article and the one preceding it are not on the public docket, however an insignificant blogger was able to acquire them. How much more could the New York Times or Washington Post accomplish should they feel a need to investigate? The NFL settlement, is atypical of most class actions. The public is acutely aware of brain injured players and has an interest in seeing them properly compensated and cared for. If too many obviously damaged players’ claims wind up rejected and then suicides or other violence should occur, or when these uncompensated players’ die and their autopsies reveal they were living with brain damage consistent with covered diagnoses that the NFL refused to pay, questions will be raised, and answers demanded from both the league and the Court. Players have long ago lost confidence in the settlement, but should the NFL continue to prevail, the confidence the public holds of our judiciary will be severely shaken because this was allowed to occur. Judge Brody now has possession of the ball. It remains to be seen if she will punt and give the NFL an easy score, or if she will toss a penalty flag for unnecessary roughness. Much depends on her next play. The clock is ticking.